Rabbit is considered white meat, it´s very low cost, low in calories and with a taste very similar to chicken. 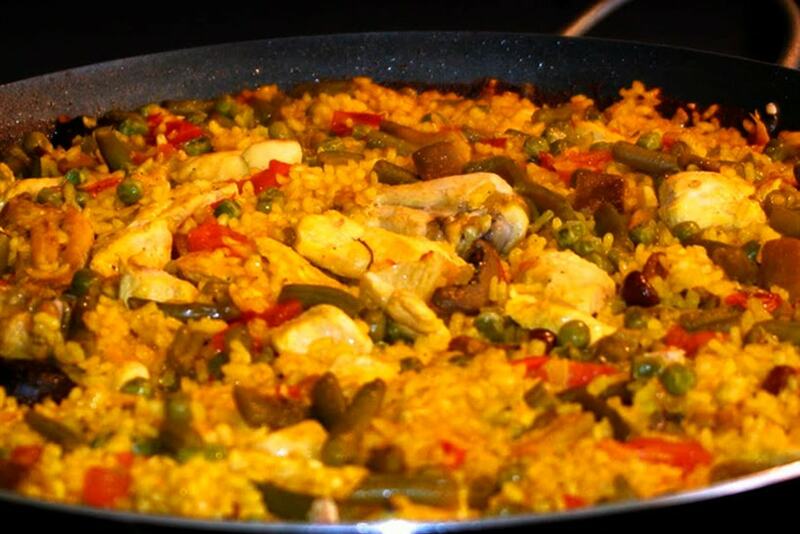 Paella with Rabbit is very traditional, especially in the central regions of Spain, where rabbit is very abundant. These amounts are for 6 people. Check out our other paella recipes or the most famous one, paella seafood! 1 First, add the saffron to the chicken broth and put it to simmer in a saucepan, only until it is hot, it does not need to come to the boil. Once it is hot, turn off the heat and set it aside. 2 Next cook the green beans in water and salt for 4 minutes, until tender. Drain and rinse them with cold water so they stop cooking. Set them aside. 3 Now heat 2 tablespoons of olive oil in a paella pan over medium heat. Add a generous pinch of salt and pepper to the rabbit and fry it for a few minutes, until golden brown on both sides. Take it out and set it aside. 4 In the same paella pan, add the remaining spoonful of oil to sauté the chopped onion for 10 minutes, until it begins to brown. 5 Next, add the chopped garlic, the sprigs of rosemary and the paprika, stir and leave to cook for 1 minute. 6 Now add the peeled and chopped tomatoes and sauté for another 2 minutes. Pour in the reserved hot broth and increase the temperature to bring it to the boil. Season with a little salt. 7 Add the rice making sure it is distributed evenly throughout the paella pan. Then place the rabbit pieces, drained artichoke hearts and bay leaves around the paella pan and shake the pan a little to settle all the ingredients. 8 Next, bring to a boil at maximum temperature for 6 minutes, then add the tender beans and reduce the temperature to simmer for another 15 minutes. At the end of the time, you will see that the broth has been completely absorbed and the rice is tender. 9 To finish, turn off the heat and cover the rice with a cloth so that it rests for 5 minutes. Taste the rice and season if necessary. Serve with lemon wedges. Ask the butcher to cut the rabbit through the bone into about 6-8 equal pieces. You can also use 600 grams of boneless rabbit instead of 750 grams of bone-in rabbit. For this occasion, I’ve used a 38 cm diameter paella pan that works well for 6 servings.